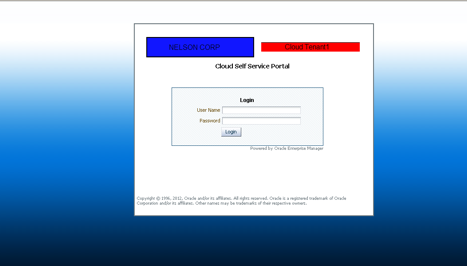 Oracle Enterprise Manager Cloud Control 12c allows us to customize the page that self service users see when logging in instead of the usual EM Console login page. This is useful for Cloud Providers who offer private cloud services to their clients. With just a few small steps you can have your own customized login page. Set a custom alternate text message for the Cloud Provider on the login page. 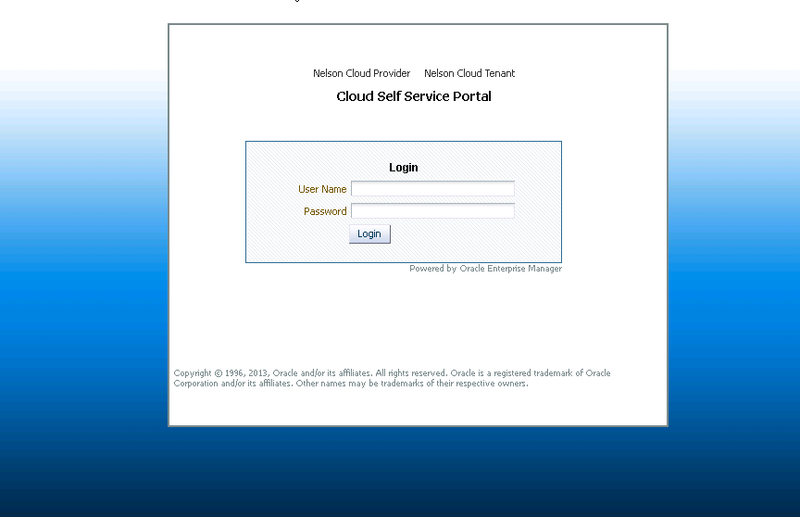 $ emctl set property -name oracle.sysman.ssa.logon.cloud_provider_alt_text -value "Nelson Cloud Provider"
$ emctl set property -name oracle.sysman.ssa.logon.cloud_tenant_alt_text -value "Nelson Cloud Tenant"
After restarting the OMS the SSA login page should look like the one in the figure below. The two _small_ logos appear as headers in the login portal and the two _large_ logos appear on the login page. If two _small_ logos are used then they should be less than 200 * 20 px each. If a single _small_ image is used then it should be less than 500 * 20 px. The _large_ logos should be less than 250 * 50 px if two images are used or less than 525 * 50 px for a single image. After restarting the OMS the login page should display the logos similar to the one in the figure below. You can also add a disclaimer text and copyright text. Unfortunately, other attributes such as background colors and custom style sheets cannot be modified but hopefully this will be enhanced in future versions. Is Nelson Corp hiring? :) Great post Leighton!! As soon as they do you'll be the first to know :). How does this affect non-self service users (like DBAs and OEM admins)? Does force everyone login this way or is there a separate URL for self-service? From what I can tell all users including non-SSA users will access the same login page. However, after logging in they'll see the usual EM Console based on their privileges.